New homes threat to Radley now tops 1000. 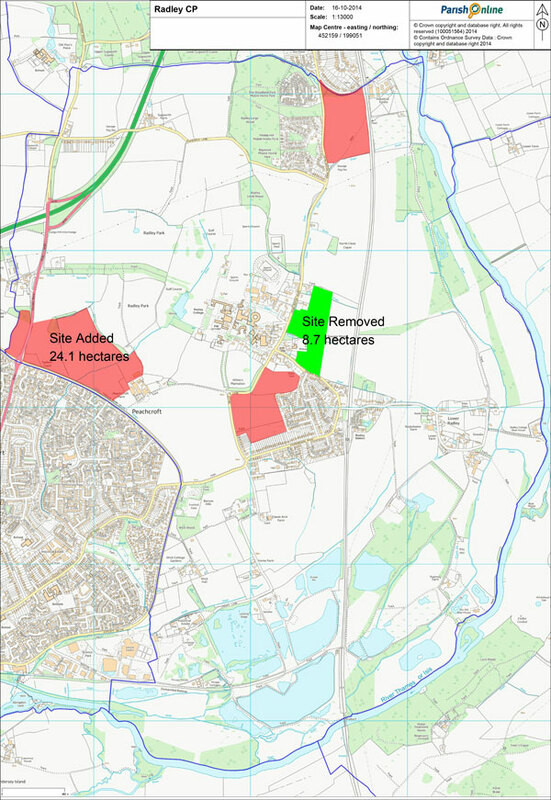 Following lengthy consultations with landowners and representatives of the local population over the Draft Local Plan, the Vale of White Horse planners appeared to have relented by agreeing to the removal, from the housing plan, of the so-called “North Radley” site, some 8.7 hectares of Green Belt land owned by Radley College partially encircling the church and school, when, true to form, The Vale once again released a bombshell by proposing another even larger site in the parish for development. (Figure 1) The newly substituted site, which is an extension of the original North Abingdon development site (Figure 2), comprises 24.1 hectares of Green Belt land to the east of the Oxford Road covering the lower southern slopes of Lodge Hill. The “North Radley” site would have accommodated 200 homes and, at the same density of build, the new site would be capable of accommodating about 500 homes, in addition to a new primary school, which is also part of the proposal. When added to the other proposed development within the parish (240 homes in “NW Radley” and 270 homes in “South Kennington”) this takes the total number of new homes currently allocated to the parish to over 1000, which would effectively double the parish population, while posing a clear threat to the parish boundaries. Map showing the changes to the Housing Delivering Plan affecting the Parish as incorporated in the revised Draft Local Plan (Sept 2014). Furthermore, the new site would engulf much of Peach Croft Farm, including the land currently used for the rearing of Christmas geese and turkeys. The proposal thus poses a threat to this important business, which also supplies fresh fruit and vegetables to the local community. Peach Croft Farm has been producing fresh hand-reared turkeys of the highest quality for over 75 years and over which time it has built up a strong national reputation for the quality of its produce. It supplies not only the local community, but fulfils orders from much farther afield, from top retailers and restaurants and retailers, including Harrods and Fortnum and Mason. With the loss of this land, and the lack of Green Belt protection in the future, the long term viability of the farm would be threatened with the eventual loss of most of the farm site to development becoming a real possibility in the longer term. Much of the land in question, including Peach Croft Farm, belongs to Radley College. While the College would surely be cognisant of the damage to its own setting (hitherto an important planning consideration) it has a duty to realise the maximum value of its assets. Faced with a windfall worth millions, the temptation will surely prove to be irresistible. While the impact on the village community and infrastructure might be less severe, significant adverse effects will still be felt. These will be due to increased road traffic, the effective loss of a functioning peripheral road, and the impact on local resources across the Abingdon, not to mention the full impact of the SHMA proposals in toto on resources across the region. In the context of all this, the promised opening up of the south-facing slip roads to the A34 at Lodge Hill is small (but necessary) mitigation, but, by the time this happens, it will probably be a case of too little too late with the A34 having no spare capacity to offer. Under the circumstances, the negotiated removal of the North Radley Site from the plan has been described as a “Hollow victory” by Save Radley Village. This land will nevertheless still be removed from the Green Belt as part of the ongoing review, which means that development on this land remains likely in the long term. 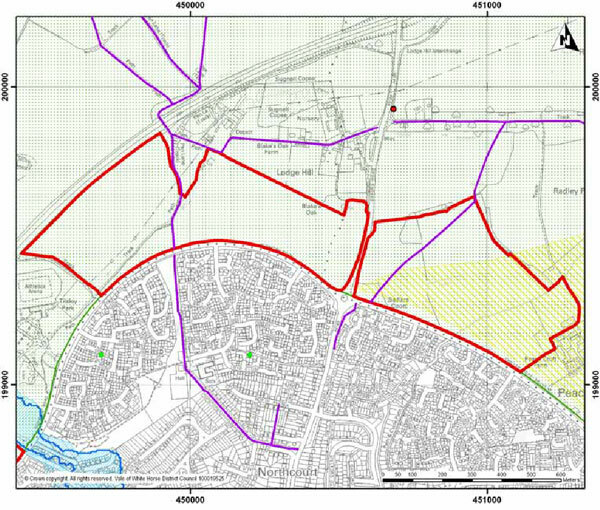 Map showing the extended North Abingdon Site as incorporated in the revised Draft Local Plan (September 2014).